You can set a task calendar to use a different base calendar template from the one you selected for the project calendar in Project 2013. Doing so takes precedence over the project calendar for that task. Suppose that you select the Standard calendar template for a project and a 24 Hours task calendar template. If you then specify that the task has a duration of one day, it’s one 24-hour day (assuming that the assigned resources also use a calendar allowing for a 24-hour schedule, such as machinery). The Task Information dialog box appears. From the Calendar drop-down list, choose a different base calendar. Click the OK button to save the new calendar setting. If a resource assigned to a task has a modified calendar, the resource works only during the specific hours that the task calendar and resource calendar have in common. Only work resources have their own calendars. That’s because material resources are charged not by time worked but by units used, and a cost resource is assigned a set cost that doesn’t relate to any time worked on a task. Even the most resourceful resources have only so many hours in a day to work. When you have to deal with variations in resource schedules, consider modifying the resource calendars. You can change the base calendar template for each work resource and set specific dates as working or nonworking. These exceptions take precedence over the project and task calendars, and control when a specific resource can work. Unless a resource has a truly unique working schedule, don’t change its base calendar template. For example, if a resource usually works a day shift but works a night shift for only a few days during the life of the project, don’t change that resource’s base calendar template to Night Shift. Unless your project deals with the most detailed level of time, where hours and not days are the typical units of measure for tasks, making these types of changes is more work than it’s worth. Display a view that includes a resource column, such as the Resource Sheet view. Simply select the view from the drop-down list that appears when you click the bottom of the Gantt Chart button on the Task tab of the Ribbon. Click the Change Working Time button on the General tab to display the Change Working Time dialog box. 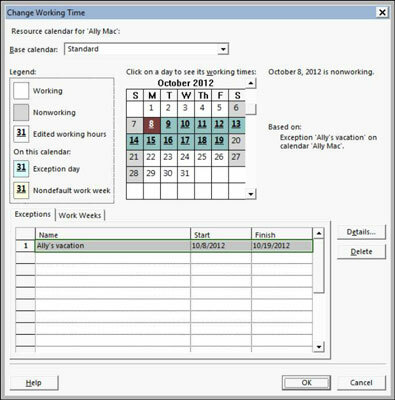 The Exceptions and Work Weeks tabs have settings that are identical to the ones in the Change Working Time dialog box for tasks, but changes made here affect this resource rather than the task. In the Click on a Day to See Its Working Times calendar section, click the day that you want to change. Click the Work Weeks tab to display it; then click a blank row, enter a name for the exception, and press Enter. If you want to edit the default work week for all weeks of the year, leave [Default] selected instead. If you want to mark a single holiday, use the Exceptions tab instead. Click the exception you just created, and click the Details button. The Details dialog box for this exception appears. Select the day or days to modify in the Select Day(s) list on the left side. You can click the first day and then Shift+click to select a range of adjacent days, or Ctrl+click to select nonadjacent days. To set working times for these exceptions, select either the Nonworking or Working ratio button. If you chose the latter option in Step 8, enter a time range in the From and To fields. To delete a row in the From and To area, click the row number and press Delete. To set nonconsecutive hours (for example, to build in a lunch break), put two or more sets of numbers (such as 8 to 12 and 1 to 5) in the start and finish columns. Set the range of recurrence. Set the start date of the occurrence, select the End After radio button, and enter the number of occurrences, or select End By instead and enter the end date of the recurrence. Click the OK button to close the Change Working Time dialog box and save these changes. Micromanaging nonworking time for your resources can leave you no time to do anything else, so avoid this urge. For example, if someone takes off half a day for a doctor’s appointment, don’t block off a day. However, if a resource takes a two-week vacation or a three-month sabbatical, you should probably modify that resource’s calendar. Resources can work overtime even if their calendars say that they’re 9-to-5ers, though you have to tell Project 2013 to schedule overtime work. You can also set a different rate to be charged for overtime work for that resource.